The Atlanta Rollergirls, the first and only internationally ranked women’s roller derby team in the city, are back on the track this February with a 2015 season of all the hard-hitting, live action sports that metro fans have come to know and love. Featuring the leagues’ popular home-team matches plus plenty of opportunities to root for Atlanta’s all-stars against nationally top-ranked teams, this season also promises Atlanta derby fans some exciting surprises. 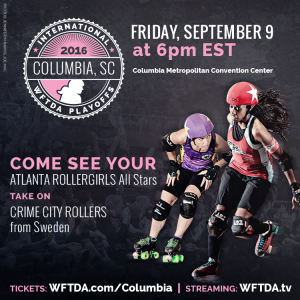 There will be Atlanta’s all stars, of course, with their notoriously brutal blocking and deadly defensive strategies, fighting to regain a place in the top ten after a fantastic 2014 season finishing 13th in the world. 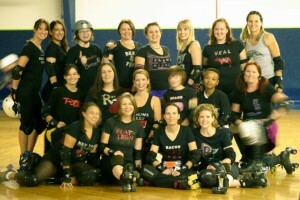 But to make things even more exciting for 2015, the Atlanta Rollergirls have decided to shake things up a bit. 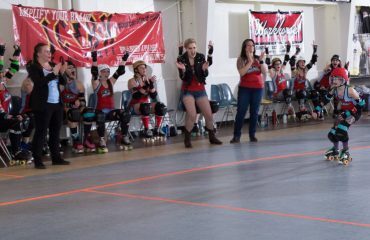 As roller derby super fans know, some of the city’s best roller derby action happens in matches between Atlanta home teams—the Apocalypstix, Toxic Shocks, Denim Demons, and Sake Tuyas—where the rivalries are intense, local, and personal. In this year’s draft, all Atlanta skaters were reassigned to new home teams, each carefully constructed and evenly matched, to bring Atlanta fans what will undoubtedly be the most competitive home season ever. So look for your favorite skaters in new colors, get ready for some fantasy-team-worthy local derby, and expect a season of nail-biters. Now entering their second decade with an international ranking and several local fan favorite awards under their belt, the Atlanta Rollergirls were the first to bring America’s fastest growing sport to Atlanta. On the derby track we say “what goes around, comes around.” — this season we’re coming back around, harder and faster than ever before. The Atlanta will be introducing new teams at their bi-annual Debutante Brawl & Reveal Night, January 30th, The Debutant Brawl is THE EVENT to attend this season to welcome the Atlanta Rollergirls’ newest members and witness the re-drafting of the ARG’s home team rosters. The event is open to the public, there’s no cover, there will be a silent art auction featuring some of Atlanta’s finest artists like R. Land and Clunky Robot, and J$SOL of the infamous RareForm DJ Crew will keep us dancing all night long. The event will be taking place at The Basement, 1245 Glenwood Ave. SE, from 7-11pm. Trust us, the 2015 Debutante Brawl will be one for the Rollergirl history books! To find out more, join our facebook event here. We can’t wait to see you there!